Fine Arts Chamber Players (FACP) invites you to a FREE Bancroft Family Concert featuring strings of the Dallas Symphony Orchestra and newly appointed Principal Flutist Demarre McGill on Saturday, February 22, 2014 at 3:00pm in the Horchow Auditorium at the Dallas Museum of Art. The museum is located at 1717 North Harwood, Dallas, TX 75201. Admission to the museum and the concert is free with no reservations or tickets required. Auditorium doors open at 2:30pm for the 3:00pm concert. For more information, please call 214.520.2219 or visit www.fineartschamberplayers.org. Musicians of the Dallas Symphony Orchestra (DSO) will present a program of chamber music by Pyotr Tchaikovsky and Argentinean composer Alberto Ginastera. Composed during a visit to Florence, Italy, Tchaikovsky’s string sextet, Souvenir de Florence, Op. 70, will be performed by Nathan Olson, violin; Eunice Keem, violin; Ann Marie Hudson-Brink, viola; Christine Hwang, viola; Theodore Harvey, cello; and Jeffrey Hood, cello. Joining the strings for Alberto Ginastera’s Impresiones de la Puna, is Demarre McGill, Principal Flutist of DSO. Mr. McGill is an acclaimed orchestral and chamber musician and winner of the prestigious Avery Fisher Career Grant. Bancroft Family Concerts are made possible in part by the Sue & Christopher Bancroft Family, Brinker International, the City of Dallas Office of Cultural Affairs, TACA, the Texas Commission on the Arts, the National Endowment for the Arts and WRR-FM Classical 101. For over 33 years, FACP has presented free classical music programs for the enrichment of North Texas area residents. In addition to the free Bancroft Family Concerts, FACP presents the free Basically Beethoven Festival in July. Each year, FACP’s educational outreach programs, Dream Collectors and Community Classics, provide over 500 free educational classes and performances in area public schools. Since its inception in 1981, FACP has served over 210,000 children and performed for over 530,000 residents of North Texas. Too often great ballet and dance performances are accompanied by mediocre, lifeless recordings of classical music. 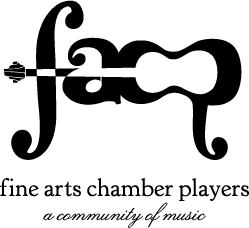 That will not be the case this Saturday, when the Fine Arts Chamber Players’ presents the Avant Chamber Ballet as part of their popular Bancroft Family Concerts series. The ballet company, founded in early 2012, is dedicated to pairing dance with live musical accompaniment. At this Saturday’s free performance in the DMA’s Horchow Auditorium, the group will dance to live performances of chamber music by Kurt Weill, Camille Saint-Saens and Erik Satie. Faces of the Sun, a new piece choreographed by the group’s artistic director, Katie Puder, and set to new music by the organization’s composer-in-residence, Chase Dobson, closes out the program.